FIVE SHILLINGS, unissued specimen note, Cerutty/Collins (1920), not numbered, 'Specimen' overprinted in blue on front (MVR p272-4). Quarter folds, crisp and original, extremely fine and extremely rare, only five notes known in private hands, four of which came onto the market from the C.J.Cerutty Estate. 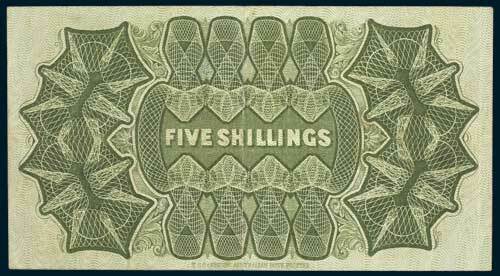 The five shillings notes were printed in 1916 without signatures. The addition of signatures occurred later, but exactly when cannot be established. On 5 February 1920, the Treasurer of the Commonwealth (Mr Watt), announced that passengers bound for foreign countries were only to take as much Australian silver coin as was necessary for the trip, but in no case was the total to exceed �3.0.0. The move was initiated by the extraordinary rise in the price of standard silver, and a shortage of silver coin being experienced, probably because of that factor. It was stated that an issue of 5/- notes was contemplated to ease the shortage of silver coin. The plates to print the notes had been prepared and an amendment was to be sought to enable their issue. 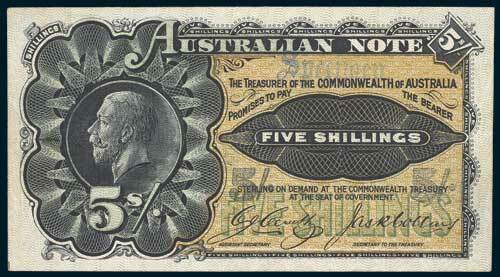 Later the Commonwealth Bank Act had included in it the authority to issue 5/- notes. Such notes however, were never issued. It would appear that a total of 1,020,000 notes were printed with virtually all being burned in 1922. Ex Noble Numismatics Sale 55B (lot 962), Dr Alan Nicholson Collection (Duplicates), other properties.